Crystal, those are all very cute! I love them and that software! Jessica, If you send my your email address I can attatch them in an email for you. Love these owl printable s! Are these from a software and if so which one? I would like to use the owl that is in the Audrey Hepburn quote to make other items such as water bottle labels, food tents, party favor tags, etc. 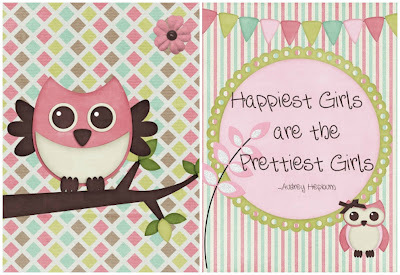 I was wondering if you have any other owl party printable items that use the owl from the Audrey Hepburn quote? Such as water bottle labels, food tents, party favor tags, etc?